Mentalix’s Fed Submit Card Processing solution is designed for service bureaus or large agencies that process a high volume of fingerprint cards. Using multiple flatbed scanners, fingerprint cards are scanned and converted to NIST/EBTS format. 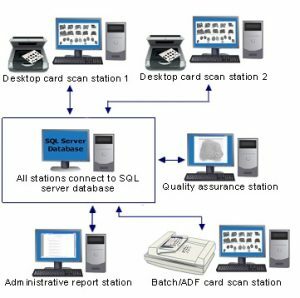 Fed Submit Card Processing provides an interface for creating electronic fingerprint files, checking the data, tracking scan statistics, and publishing the files to storage media or submitting the transactions to an AFIS. Mentalix can work with you to tailor the system to match your company’s requirements. With segmentation function, prints are auto-located during scanning, & user has the option of editing the crop boundaries for each print. Mentalix can add custom functions as needed, and will then price the system based on a per-card model with a minimum expected volume. The costs of software and maintenance are included in the per-card price. 20-inch or larger LCD flat-panel display. SXGA (Super Extended Graphics Array) capable. For remote support: PC Anywhere V12.5 Host or installed LogMeIn client. Allows Mentalix support personnel, while under your supervision, to diagnose problems on your system. Software Maintenance: Annual maintenance includes one year of phone/e-mail/remote support (weekdays 8am-5pm Central, excluding holidays) for Fed Submit software, plus maintenance releases (updates).